Fall is one of our favorite seasons in New York City. Central Park puts on its autumn colors, the city is host to fashion week, new Broadway shows debut and it’s harvest time for pumpkins and apples (and with it pie and cider). Here we’ve compiled highlights of happenings around the city that will make you fall into that autumn spirit. Don’t miss out on all the city has to offer this season. Fall Festivals. There’s really no shortage of festivals in the city this time of year. Street fairs and fests spring up all over town, usually featuring live music and seasonal eats. To name a few, Randall’s Island Park hosts their annual Harvest Festival on Oct. 15. Great for kids, this year’s fair celebrates the fall harvest with live music, face painting and seasonal goodies. Another Fall street fair to look out for is the Avenue of Americas Autumn Fest, held Oct. 21 in midtown, from 10am-6pm, with live entertainment and throngs of vendors. For a boundless fall celebration, check out what’s going on at the Queens County Farm Museum in Queens. The farm has their very traditional county fair Sept. 23-24, with pie eating and corn-husking contests. If you miss this event, Queens County Farm has more in store for the season, with their Kickoff to Fall event Oct. 1, with pie, cider, live music and a pumpkin patch. If that’s not enough, the farm also opens their “Amazing Maize Maze,” a 3-acre corn labyrinth for the month of October. Get lost in corn maze in Queens for a truly NY experience. And, what’s fall without Oktoberfest? This year’s NYC Oktoberfest is held every weekend through Oct. 2, with live music and free admission. Guests can enjoy 2-hour beer tastings to the tune of $60. Central Park fall foliage. 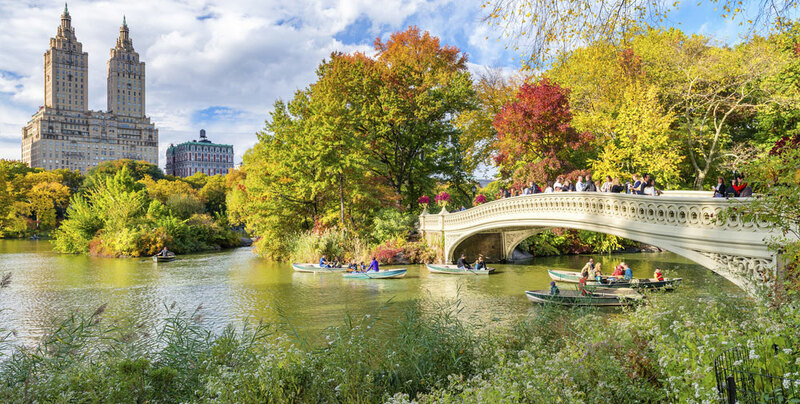 To check out the many colors of Central Park in Fall, we recommend a slow row through the Central Park Lake. Rowboat rentals are $15 per hour at the Loeb Boathouse. For more lookout points, staff members at Central Park made a map of the best places to spot fall foliage here. Union Square Farmers Market. This farmers market dates back to 1976, but has grown substantially over the years. The market hosts 140 regional farmers, fishers and bakers with products for sale Mondays, Wednesdays, Fridays and Saturdays from 8am-6pm. If you can’t quite make it to the other festivals, Union Square’s market is perfect for travelers passing through and wish to try apple cider, pie and other fall offerings. Located on 17th Street & Union Square. Finally, Macy’s Thanksgiving Day Parade. The New Yorker Hotel is a proud host of the event, housing marching bands, those in costume and even those responsible for holding down the giant balloon floats. The internationally-famous parade starts on 77th Street and Central Park West continuing towards 59th Street, Columbus Circle and down 6th Avenue, ending on 34th Street and 7th Avenue right in front of Macy’s Herald Square, just one block away from The New Yorker Hotel. This is an event you’ll never forget and is a perfect way to cap off the fall season.